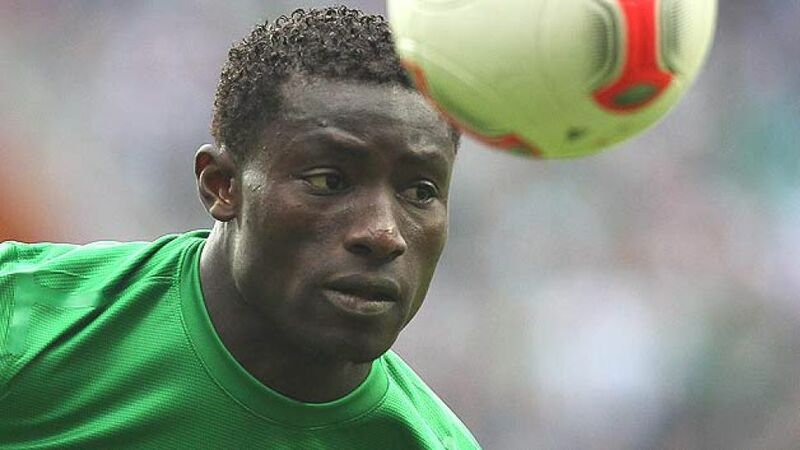 Akpala: "Bundesliga is popular in Africa"
Bremen - Werder Bremen's last-minute buy, Joseph Akpala, arrived in northern Germany just days before the end of the transfer window. He was too late to play in Bremen's opening game of the season against Borussia Dortmund but just in time to take his Bundesliga bow a week later in no less a game than the classic northern duel with Hamburger SV. A baptism of fire, then, for the Nigerian striker - but he knew what he was letting himself in for. "I had been told the history of the derbies over recent years and that's why, as a Werder player, I am even more delighted about these three important points. I'm particularly pleased for our fantastic fans," Akpala told bundesliga.com after the Green-Whites' 2-0 victory. The 26-year-old also spoke about his reasons for moving to the Bundesliga, his strengths on the field and what he hopes to achieve at Bremen. bundesliga.com: Joseph Akpala, you may not have started the game on your Bundesliga debut, but you must still be satisfied with the 2-0 win? Akpala: Yes, definitely. I'm really pleased that my debut went so well. We've won and I was able to play a few minutes after just a short time in Bremen. Now it's important that I settle into the team as quickly as possible. bundesliga.com: Did you know beforehand how important the North Germany derby is for the fans? Akpala: Yes, I had been told the history of the derbies over recent years and longer and that is why, as a Werder player, I'm even more delighted about these three important points. I'm particularly pleased for our fantastic fans. bundesliga.com: Can you already perform the Bremen fans' dance? Akpala:(Smiles) Oh yes, I saw that at our game in Dortmund, how the fans are so crazy - In fact, that was the first thing I learned after arriving in Bremen. bundesliga.com: Is this great atmosphere in the stadium also one of the reasons you wanted to move to the Bundesliga? Akpala: It is always something special to play in such an amazing atmosphere. But what was ultimately decisive was that I can take the next step in my career in the Bundesliga after being able to improve in Belgium. And I'm pleased that the move to Werder came off. bundesliga.com: You are not very well known to German football fans - can you describe your strong points? Akpala: It's always good for a striker when he can win the ball and get in around the back of the defenders quickly to get into the right position to score goals. I think that those are precisely my strengths. Hopefully, I will soon be able to demonstrate that to football fans in Germany. bundesliga.com: What can you still improve upon? Akpala: Even if you have been in the business for ten or 20 years, there are things you learn every day. And I am ready to learn day by day, whether it be in training or in games. bundesliga.com: And what goals have you set yourself with Werder? Akpala: My personal goals are the same as those of Werder Bremen - we would like to get the most out of ourselves this season and give it our best. bundesliga.com: Was your family back in Nigeria able to follow your first Bundesliga appearance? Akpala: Absolutely. My parents watched the Dortmund game on the television. The Bundesliga is very popular in Africa and, fortunately, there are enough opportunities to see the games. bundesliga.com: Have you already been able to learn a little German? Akpala: "Guten Tag" was the first term I learnt, and I can count a bit too. I will learn German as quickly as possible.